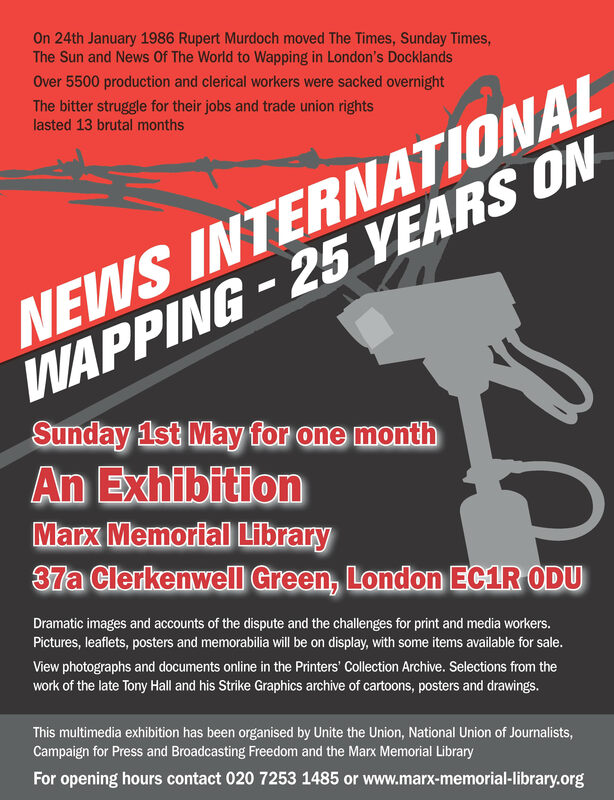 A special exhibition of memorabilia telling the story of the dispute between the print unions and Rupert Murdoch 25 years ago opens on May 1st at the Marx Memorial Library, Clerkenwell Green in London, home to the archives of the print and papermaking unions of the UK. The dispute at Wapping was one of the key industrial disputes of the Thatcher era, when 5,550 production and clerical workers were sacked by Rupert Murdoch overnight. Dramatic images, photographs and accounts of the dispute – when Rupert Murdoch used his vast wealth, aided by the Conservatives’ anti-union legislation to facilitate the dash to Wapping – will be on display. The multi-media exhibition has been organised by Unite, the National Union of Journalists, Campaign for Press and Broadcasting Freedom and the Marx Memorial Library. For opening hours, please ring 020 7253 1485 or visit the Marx Memorial Library website. The exhibition will be open for one month before many of the exhibits will go on display at the TUC’s Congress House in London and then in the autumn to the Unite offices in Liverpool. On April 28th a special preview will take place at the Marx Memorial Library at 3.00pm. Speakers at the preview will include: Tony Dubbins and Brenda Dean the leaders of the print unions the National Graphical Association and SOGAT during the dispute; Frances O’Grady DGS of the TUC; Ann Field, former Unite National Officer who has curated the exhibition, along with veterans of the dispute. The preview will be chaired by Tony Burke, Unite Assistant General Secretary. This entry was posted in Employment Rights, Politics, Solidarity, Trade Unions, Trades Union Congress, Unite The Union, Workers Uniting. Bookmark the permalink. Sorry Andrea. The exhibition has ended at the Marx Library. It was also on at the TUC Congress House, but it has ended there as well. Next public viewing will be during the Labour Party Conference at the Unite Offices in Liverpool.